Learn how to use the Sphero robotic ball with an iPad, build obstacle courses, and challenge others to guide Sphero through the obstacle courses. -Cut all of the insulation tubing in half, so that the middle hole is a semi-circle. -Install Sphero and Sphero Draw apps on all iPads (other Sphero apps are also available). -Set up Sphero Terrain Parks. 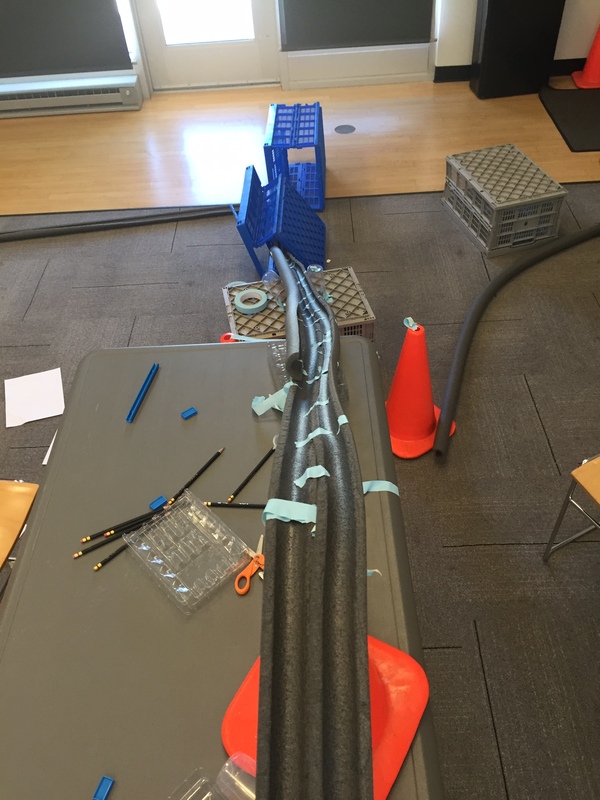 -Set up two long lanes on the floor (lanes can be made of masking tape) with a Sphero Terrain Park set vertically at the end of each lane. -Set up an obstacle course out of cups. -Sync each iPad’s bluetooth with a Sphero. 1. Settling in, welcome, and introductions: 5 minutes. 2. Who is familiar with Sphero? What is Sphero? How does it work? : 5 minutes. 5. Design testing and last-minute modifications: 10 minutes. 6. Obstacle course testing: 20 minutes. Explain that they will have 20 minutes for each person in the group to practice using Sphero. Once they are all comfortable driving Sphero, they can try out one of the two practice courses you set up. 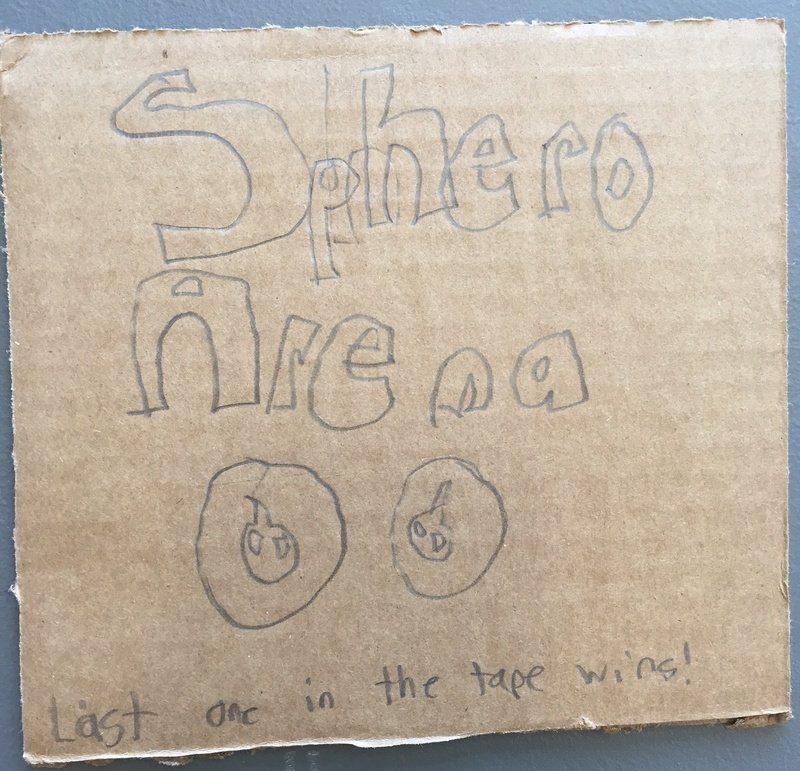 The objective is to get Sphero up on the terrain park in the course with lanes, and the objective of the other is to successfully navigate the plastic cups without knocking them over. Tell them that they have another 30 minutes to build an obstacle course for the other teams. Explain which items they may use in the room, and specify what they can use masking tape on (if they can’t use it on the walls, say so!). After 30 minutes, tell them to test their design with their own Spheros and make modifications. Give them 10 minutes. Give them the last 20 minutes to either a) continue testing and tweaking their own design, or b) trying each other’s designs. Our groups did a mix of both–some were more interested in making their designs perfect, some wanted to try other people’s designs. The teams who continued to work on their own designs were accommodating of those who wanted to try out their design, so it all worked well. We limited this program to 16 participants, so that there were 4 children to a team. This was a good ratio. Our intent was for the teams to use masking tape to draw out mazes on the floor and incorporate obstacles into them. We had the foam pipe insulation pieces available so that they could tape them into shapes/obstacles on the floor. However, the mind of every single participant must’ve gone immediately to “ROLLERCOASTER!” We let them do whatever they wanted with their designs, since we built in time for testing and redesign. We did not think the foam pipe insulation would support the weight of a Sphero, and we were unsure that the Sphero would drive very well on the texture of the foam. We were wrong! The foam pipe insulation worked awesomely. 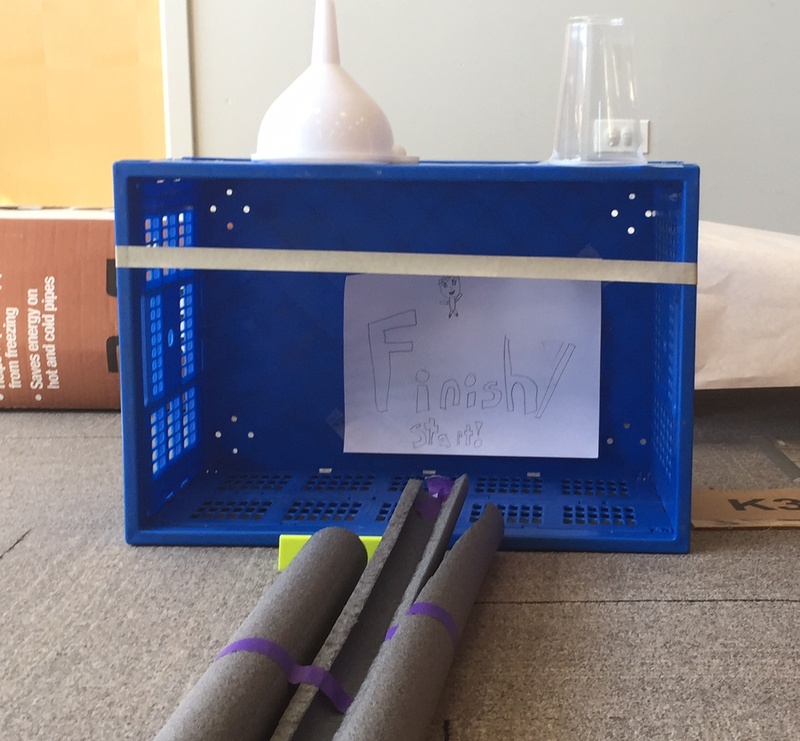 Though they had to use a lot of supports underneath the foam, going this direction forced them to be more innovative and think more critically than they would’ve with our original program design. It was fantastic to see the kids figuring out where the design was flawed and working as a team to change it. 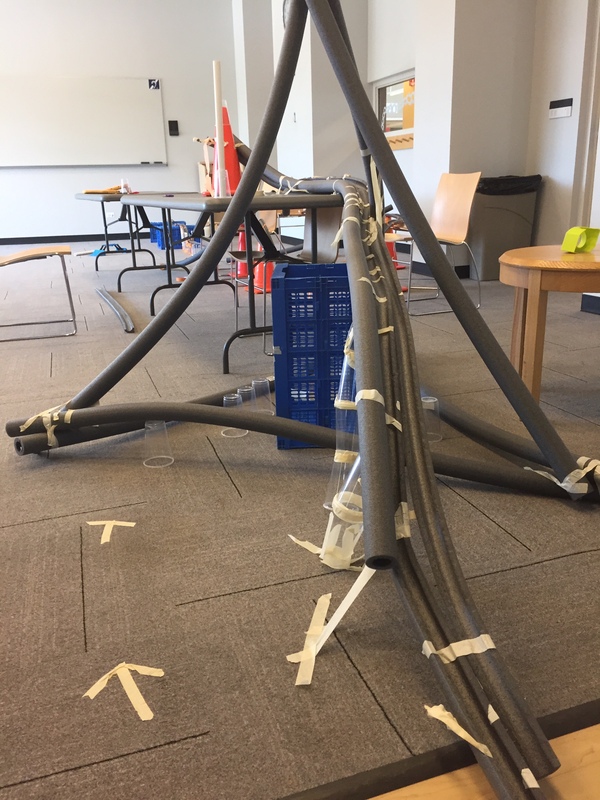 That being said, if you do not want them to use the foam pipe insulation to build crazy rollercoasters, the only thing you need to do differently is specify that they must build everything on the floor and that they cannot use tables, chairs, etc. We would also make the plastic cup obstacle course less difficult, since fine control over Sphero’s movements is very difficult. It was fun for them to knock over cups, sure, but it would’ve been more educational if it was easier. This program could easily be 2 hours instead of 90 minutes. The kids had a great time and were not really ready to leave at the 90-minute mark–they were still intent on modifying their designs! This program was also done with 7th-12th graders, and it went over very well. We did not do the teen program, but we believe the participants built their courses independently instead of working in teams. 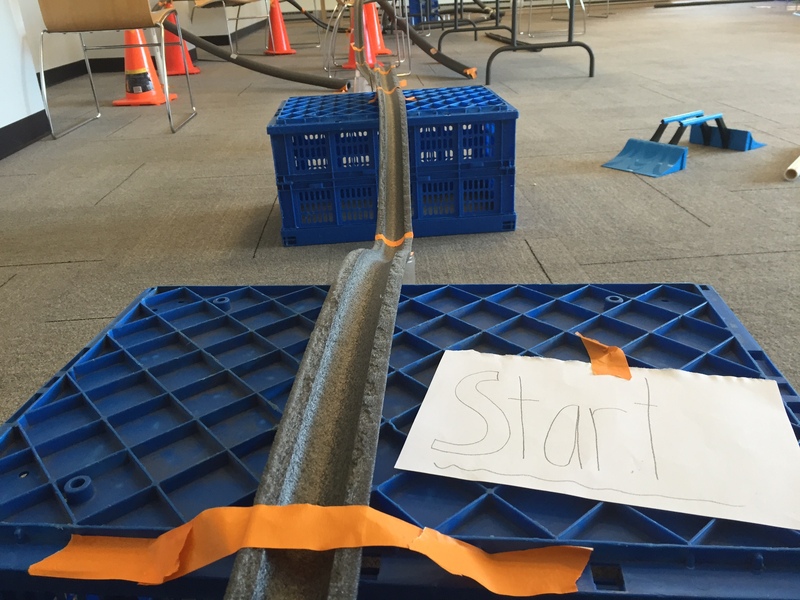 3rd graders would likely be fine for this program, but we think younger children would have had more difficulty working in teams to build obstacle courses, as well as with controlling the Sphero.